Firstly, huge congratulations to you if you have just got married - we hope that you had a wonderful wedding day! 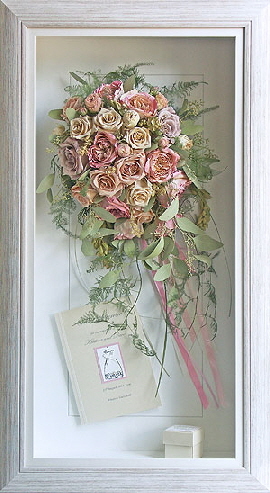 We often find that it is not until a bride actually sees and holds her beautiful bouquet that she even considers keeping it forever as a beautiful keepsake. If your wedding has taken place and you would like to have your flowers preserved, then time is of the essence and you will have to act fast. In an ideal world, your flowers will need to be with us as soon as possible after your wedding or event in order for us to get the very best results from the freeze drying process. However, depending on the type of flowers in your bouquet, we can preserve flowers that are up to one week old. To find out if we can fit you in, please telephone us on 01202 848801 and we will do our best to help. We will also sort out collection of your flowers and advise you exactly how to pack your flowers if you are sending them to us by courier or Royal Mail. Remember that you do not have to even think about your design and framing options at this stage. The important thing is to get your flowers to us as quickly as possible so that the freeze drying process can begin. Design and framing options can be sorted out when you get back from your honeymoon. Call us now on 01202 848801. Don’t let your beautiful bouquet wilt and die after your wedding. We can freeze dry and frame it for you so that you can keep ir forever. You only get one chance to preserve your flowers so don’t leave it too late. We can preserve your flowers up to one week after your wedding.